So, ‘Edge’ has been and gone (and very successful it was too!) and so has ‘In Passing’. And now, although it doesn’t seem like five minutes have passed, the year has flown by and it’s time for another Winter Group Show at Linden Hall. This year’s show is even bigger and better than ever, with almost a hundred artists taking part, and I’m delighted to be one of them. It’s a mixed exhibition of painting, sculpture, ceramics, prints, photographs, and of course, glass, and it features a fine mixture of emerging and established artists - check out the list of names on the Linden Hall website. There’s some very well known ones there, so do get along there if you can, you won’t be disappointed. See the Exhibitions page for details of dates and time. Also on the horizon is a Christmas Emporium at Creek Creative in Faversham (at 1 Abbey Street). The Café Gallery will be full of individually handmade items from a range of artists and artisans. I’ll be showing some of my kiln fused glass, and also some of the jewellery that Dave Kilford and I make under the hat of AG47. The Emporium will run from Tuesday 4th to Friday 21st December, and if you’re on the look out for unusual and individual Christmas gifts, this is the place for you! 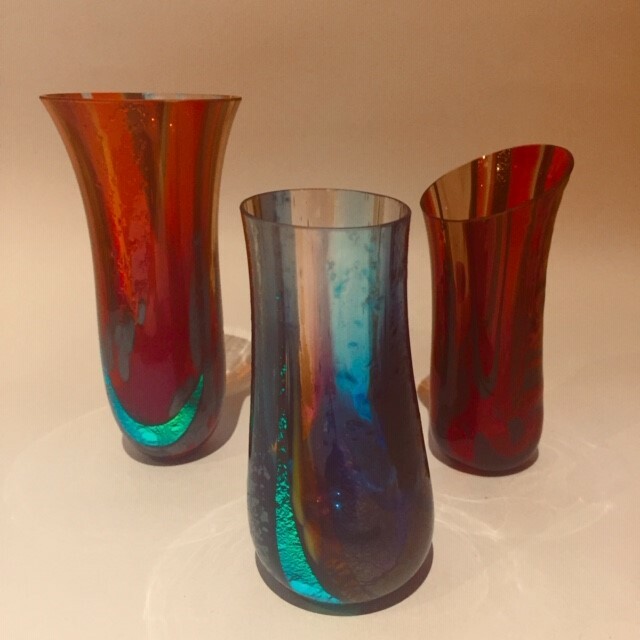 Meanwhile, I’ve recently been to a Workshop taught by the excellent Sarah Sillibourne, and have learnt how to use the ‘drop out’ method of making kiln fused glass vessels - the image shows my first efforts. It’s a fascinating process and I’m looking forward to exploring it further in the months to come. I still have a vast amount to learn about it all, but I know I’ll enjoy the practice.